The heart has a complex electrical system which regulates the contraction and relaxation of its muscular wall. This enables the heart to function by receiving blood during relaxation and pumping it out with force to the lungs and other parts of the body. The rhythm of the heart beat is controlled by a natural pacemaker known as the sinoatrial node (SA node) which generates the electrical impulse. To prevent simultaneous contraction of the atria and ventricles, the atrioventricular node (AV node) delays the conduction of the impulse to the ventricle. Fibers from the SA node to the AV node (internodal pathways) and then from the AV node to the rest of the ventricles (Purkinje fibers) serves as the electrical ‘cables’ of the heart. The sinoatrial node, or SA node, is known as the natural pacemaker of the heart. It regulates the rhythm of the heart beat by generating an impulse that causes the heart muscle to contract. The faster these impulses are generated, the faster the heart will beat. In order to carry out is function, the SA node has a specialized structure with unique characteristics that ensures it keeps the electrical activity ongoing throughout life. The SA node is a small structure, measuring in at about 3 millimeters wide, 15 millimeters and a mere 1 millimeter thick. It is flat, elliptical structure located on the outer back wall of the right atrium. The SA node is actually a specialized type of cardiac muscle but lacks the contractile filaments that allow muscle to lengthen and shorten. How does the SA node work? The constant electrical activity within the SA node is a consequence of the different type of ion channels within the fibers. There are three types of channels – fast sodium channels, slow sodium-calcium channels and potassium channels – which allow the influx of positive ions into the fiber. The SA node fibers have a negative resting membrane of about -55 to -60 mV (millvolts). The fibers are surrounded by large amounts of sodium ions which gradually enter the fiber through the leaky channels. Slowly the voltage rises until a threshold level of about -40mV is reached. At this point, other channels are activated and there is a sudden rush of positive ions into the fiber. Sodium and calcium ions rush in while potassium ions flow out of the fiber. This causes the action potential. The sodium-calcium channels quickly become inactivated while the potassium channels remain activated for slightly longer. The continued outflow of potassium ions means that positive ions are leaving the fiber and therefore reducing the intracellular potential back to its resting membrane potential of -55 to -60mV. This is known as a state of hyperpolarization. Eventually more and more potassium channels close. The slow leaking in of sodium once again reduces the resting potential and another action potential is then initiated. The period in which the threshold level is reached and the state of hyperpolarization provides the delay to ensure that an action potential is not generated immediately after the previous one ends. Essentially this regulates the rhythm of the heart. The sinoatrial node connects directly with the atrial muscle fibers and impulses can immediately reach the muscles. Since the SA node is in located in the wall of the right atrium, a specialized band of fibers known as the interatrial bands carry impulses to the left atrium. Impulses travel up to three times more faster through these bands than it does through the atrial muscle. However, the atrial conduction system is such that impulses will be confined to the muscle of the atria. Therefore the internodal pathways are necessary for contraction of the ventricles. The internodal pathways as the name suggest transmits the impulse generated in the SA node to the AV node. There are three bands in the internodal pathways known as the anterior, middle and posterior internodal pathways. It is named according to the atrial wall that it curves around to finally reach the AV node. Although an impulse from the SA node takes only about 0.3 seconds to reach the AV node, it does not immediately pass on to the ventricular muscle. Instead it is delayed by another 0.13 seconds in the AV node and AV bundle. The AV node is a small structure located on the rear wall of the right atrium, just behind the tricuspid valve that separates the right atrium from the right ventricle. Conducting fibers known as the AV bundle carries impulses out to the muscles of the ventricles. To prevent impulses in the ventricles from traveling back to the atria, an insulating band of tissue known as the AV fibrous band exists between the atria and ventricles. The delay in the AV node is essential to prevent both the atria and ventricles from contracting simultaneously. 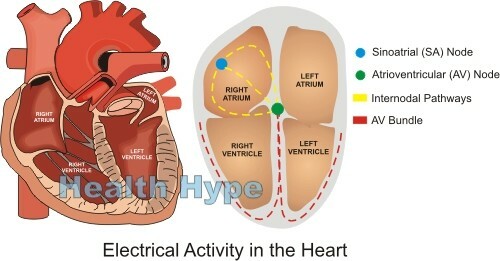 Although about 80% the blood in the atria empty into the ventricles passively, atrial contraction forces that remaining 20% into the ventricles for maximum cardiac output. This can only be achieved by the atria contracting while the ventricles are relaxed. The delay is momentary though and a fraction of a second after atrial contraction, the ventricles then contract. The AV node receives the impulse from the internodal pathways, delays it by approximately 0.09 seconds and the impulse passes through the AV bundle which delays it for a further 0.04 seconds. The AV node and bundle is able to achieve this delay by slowing the conduction of the electrical impulse. The gap junctions between successive cells of the AV node and bundle fibers are fewer which therefore increases the resistance to the impulse. The AV bundle runs through the ventricular septum where it branches into right and left bundles. This extends all the way to the apex of the heart. The fibers of the AV bundle are large and unidirectional so that impulses cannot travel backwards to the atria. Within the AV bundle is the specialized Purkinje fibers. It is unique because it can transmit impulses several times faster than the other parts of the heart’s coduction system. This ensures that the electrical impulse travels instantly to most parts of the ventricular muscle and contraction occurs simultaneously. If this did not occur, then parts of the ventricles will contract independently and blood will not be pushed out with the same force as it is in the healthy heart.